The biggest shift in local weather happened at levels where the change can only be inferred by tracking changes in satellite imagery. While the first half of the week was certainly hot over both the coastal plain and the interior, by Wednesday afternoon there was a noticeable shift in the cloud patterns, and by Thursday this showed up in a cloud base that has come down by an impressive 8,000 feet. At the beginning of the week, large parts of the central interior and the north, were still crushed in the afternoon by a very thick atmosphere that reached well above 50,000 feet. When the outer limit of the atmosphere sits at that level, it usually shows up in atmospheric density readings which may go as high as 1.2 kg per cubic metre. Multiply that by 20,000 metres (height) and one gets a sense of the immense forces at work on such a massive scale that the up or down movement of only a few hundred feet, makes a substantial difference to the temperature at surface level. This in turn has a direct bearing on relative humidity which is the basic indicator for rain. Translated to feet, with which pilots are more familiar, the 500 mB surface came down from around 21,000 feet to 18,000 feet (the textbook level), and then on Thursday to below 14,000 feet. This is a good sign as a lower cloudbase indicates that the northern (tropical) system is growing stronger, and the high pressure impact from the south is growing weaker. This week’s visual shows a synoptic pattern that essentially is still a left-over of a winter pattern. The two blue circles mark the cores of the South Atlantic high (left) and the southern Indian high (right) respectively. The pink oval shows the position of the continental high. Note that it is mostly offshore. This is the only significant departure from the (belated) winter stance of the other two highs. The red curve is the airflow direction on the surface which is normal for this time of the year. When tracking the highs’ cores, it is important to note where the 1024 mB isobar runs. This is a more reliable indicator of the rest of the high’s behaviour than the higher readings deeper in the core. The synoptic map shows that the South Atlantic high’s core is still a couple a hundred kilometres north of 40°S latitude. This is a typical winter position. The southern Indian high’s core extends south beyond 40°S for about 700 kilometres but about three quarters of the 1024 mB core is still north of this latitude. This shows a tentative transition between the seasons but it is not in full-blown summer mode yet. 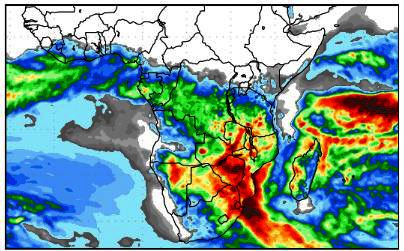 As long as the cores of the two highs are stuck so far north, Namibia will not see good rain. All outlooks are fairly unanimous in their expectation of a four-day window of lower pressures over the sub-continent ahead of the arrival of the next South Atlantic high. The only difference is how strong the mid-level trough will become, and how far west the system will develop. With the cloud base expected to recede some more to about 12,000 feet, there is a reasonable chance for isolated showers over the weekend from the Angolan border in the north up to around Mariental in the south. Lower surface pressures remain until next Wednesday when the impact of the South Atlantic high should be felt in Oranjemund and Lüderitz. Next Tuesday will see very windy conditions in the southern Namib, spreading to the Karas, and later the Hardap regions. Wednesday morning may again be surprisingly cool up to the Windhoek latitude.